What is everyone catching the crappies on this year? I've had great success this winter so far with red glow ice jigs in size 10 and 8 tipped with maggots. Custom Jigs n Spins Ratso's in size 8 are a good choice as well, with a pink head and white body, or else all black. As far as catching crappies in the winter, it can change from day to day and even sometimes hour to hour. Bring along some euro larvae (colored maggots, about a third of the size of a waxie), some waxies, some small crappie and some minnows. yah, ive tryed using lots of stuff but mostly catching them on medium sized jigs and crappie minnows. #10 glow demons with orange head. Plain red #8 octopus hooks with the smallest crappie minnows I can use. 1 and 2 pound test line for the crappies. Eyes = #4 kahle mustad hooks and shiners, #8 red octopus hook and fatheads for the tipups and deadsticking. swedish pimples and cicada lures for jigging. All of my crappies have come on small ice jigs tipped with multiple euros. we have been diong alright on small glowing green or pink jigs. genzworms fatboys,etc. havent tried much else though. and then tip with minnows. 1/16th maribou jigs with power waxies, smallest Northland forage minnow jig or spoons with power waxies, shrimpos, glow red forage minnow spoons and a few on the Northland Forage Fry. Glow demonds on deadstick with minnow or bare pink hook. My latest Crappies came with Custom Jigs Glow Demon with the orange or green top accompanied with a Ice Buster Bobber trimmed down to the utmost sensitivity! My usual bait is a Crappie minnow or Waxworm with a Shrimpo or Ratso. #4 Demon with red dot in center of body. Only found in the northern area of MN. Custom Jigs and Spins sends all they make to Cannon Tackle who distributes them to tackle shops. I've also had good luck with the other C.J.S. lures. #6 red Glitter Glow jigs with small crappie minnows or waxies. I have also had good luck using Pilki jigs with minnows and waxies. I have got all my crappies on Custom Jigs and spins slender spoons and walleye kit tiped with just a minnow head. i aslo have had real good luck with srimpo,ratso.glow demon and the nucleer ant. My 2 cents custom jigs and spins make the beat panfish tackel end of story. Last time out just for the heck of it I put my sunfish rig down. A #12 green moon glow with a wax worm. Got my limit in fifteen minutes and to my surprise only lost one on the way up. This is not normal for me but on that type of rig but it worked last time!!! 1/16oz Glow Devils (found here on the site, but in extreme demand). All time favorite is the gold/red combo, and the rest of the glows work great too. Big bluegills love the gold/red a lot too! 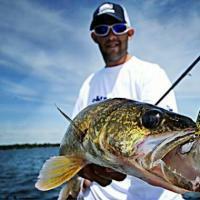 CLICK HERE - For Great Panfish, walleye, pike, and laker tackle. I know JBlures makes the glitter jig but who makes the Glow Demon that is being referred to here? I'm assuming that we are not talking about Glow Devil spoons here. Are we? I'm just looking to pick up some more crappie and sunny jigs and want to make sure I pick up the right stuff. My best luck has come on plain or colored hook and a small minnow under a bobber. When the fish have been scatterd, I put on a small buckshot jigging spoon,remove the trebel and add a 2'to 3' dropper with a single hook,splitshot,and a minnow. This has worked great for me. custom jigs & Spins makes the Demon. They have regular demons, glow demons, and ultra or super glow demons. I haven't tried the glow devils? Where can you order them at? I have been doing well with the Rat Finke, and the Shrimpo's by Custom Jigs. Just bring this back up. This season there have only been 4 or five baits on the end of my line. Custom Jigs and Spins Demons in size 6 or 8, Ratsos in size 8, Shrimpos in size 6, and Salmo Chubby Darters in the new glow color! The Custom Jigs and Spins Demon has taken the most crappies by far this year! I have been catching crappies on size 6 glow rattlin eye jigs, mainly blue and a glow red skinny teardrop. I just bought some rattlin' eye genzworm and the one day I used it I was very sucessful with it. 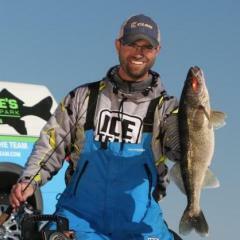 The same jigs have been catching walleyes off the bottom. The crappies have been mainly caught suspended. You can order Scenic Tackle Glow Devils and Custom Jigs and Spins Crappie Kits, Glow Demons and Panfish Kits with all the hot jigs and lures by CLICKING HERE to see the top ice fishing tackle found anywhere! !